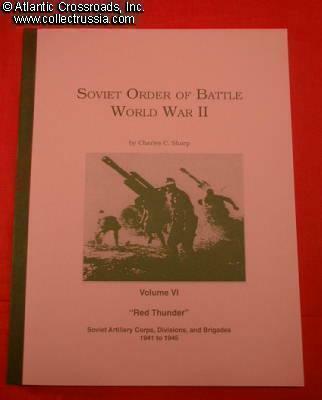 "Soviet Order of Battle , WW2, Volume 6: Red Thunder, Soviet Artillery Corps, Divisions,and Brigades 1941 - 1945". "Soviet Order of Battle , WW2, Volume 6: Red Thunder, Soviet Artillery Corps, Divisions,and Brigades 1941 - 1945". Including Rocket, Antitank, and Mortar Units, by Charles Sharp. This is one volume of a series of 12 books on history of Soviet units includes their organizational structure, date of activation, number and type of weapons used, participation in battles, association with large units, etc. Gives detailed account of development of Soviet branches of service during WW2. Very complete and highly reliable reference. The books are soft bound, large format, and average about 110 pages per volume. English text.